Welcome to the Air Power Australia Analysis series! 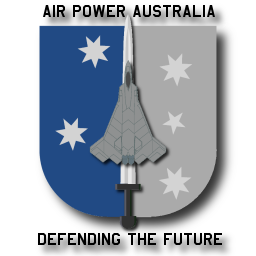 The Air Power Australia website was launched this October with the aim of 'of promoting air power in Australia, stimulating public and parliamentary debate on air power topics, educating the community and publishing and archiving papers and articles on air power topics'. These are ambitious aims - air power has not been a prominent part of the public and media debate in recent years in this country. The active and intensive air power debate we observed during the 1990s has largely dissipated. There is no academic or professional journal in Australia which deals solely with air power issues. Popular and professional aviation and defence journals cover military aviation issues very actively, but are severely constrained in what topics can be covered simply due to the commercial realities of constrained page counts and public interest. The DoD studies centres are largely constrained in what they can discuss by the internal politics of the Department of Defence. The Air Power Australia Analysis series will aim to plug the extant gap in coverage by providing a vehicle for academic and professional analysis discussion articles and papers which do not fit the parameters of existing publications in Australia. Areas of policy, policy reform, strategy, technological strategy and basic technology will receive priority. Third party contributions to this series will be reviewed by the editor and internal reviewers and if of acceptable quality and suitable focus, may appear in this series. History has never treated kindly those nations which have fallen behind their peers in the air power game. The editor and contributors to Air Power Australia do not wish to see Australia follow such a path - the cost to the national interest is far too great for this to be an acceptable outcome for this community. The purpose of the Air Power Australia Analysis series is to turn the tide in Australia and see air power receive the priority it deserves in the ongoing national defence debate.